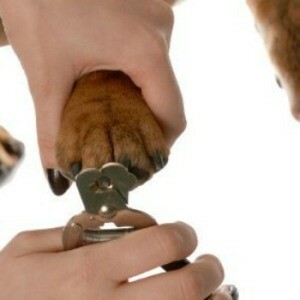 Trimming your dogs nails should be a regular part of your dog's grooming. If you choose to do it yourself, it is important to learn the proper way to trim them. This is a guide about trimming your dog's nails. Like everything else the price to have my dogs nails cut went up too. I'm not at all comfortable cutting his black nails myself. However, Teddy, who I recently adopted doesn't mind having his paws touched. I had him groomed and now that his nails are trimmed, I can keep them up myself. At night when we're watching TV, he usually falls asleep in my lap and I use my 2 sided nail file to maintain their length. A little tip for those of you who trim their own pet's nails. I found that it is very easy to stop your pet from slipping around on the table or bench by using a piece of non-slip rubber mat that can be bought from many stores. I picked up about 3 meters in a roll for only a couple of dollars at a $2 shop. Cut the pieces to suit the standing size of your pet, and you will find that the dog will not slide around and feel unsafe at all. It washes in the machine or by hand easily, and is light and it can be thrown in a cupboard or drawer until needed. It is also great for a bath mat - no slipping and sliding. In fact it's useful for many things, like opening tight jar lids, in the sink for delicate washing, draining cutlery, all sorts of things. Get that imagination going! Learn to clip your dogs, cats, or birds nails. Invest in a good set of clippers (around $7.00-$12.00) from your veterinarian. It will save you the cost of an office visit. Pet stores that offer grooming probably have instruction folders on the procedure, or try the internet for "how to" sites. I have used this method all my life with success. You need two people to comfort the dog. All animals like a "tummy rub" and will lay on their side for the nail cutting. As soon as you bring your puppy home, start playing with their pads. Using your fingers, touch and rub the pads of each paw. Do this daily and your pup will become accustomed to you handling their paws, making the future years of nail-clipping much easier. Seeing the Pediaws on TV made me want to have one for my Chinese pug. She has very sharp claws and for some reason it is her joy to scratch the living day lights out my legs. But it is just my laziness that causes the sharp nails. When I clip my dog's nails it is always a scary thing. Just be careful and slow. I have someone hold Lanee (she's a small dog) while I do the clipping. Do not go in the pink. I have 3 dogs and it can become very expensive having their nails clipped. How can I learn to do it safely? Here is a great how-to page. One thing you need to be certain of is having a very sharp set of trimmers. I prefer the scissor type. Millers Forge makes a great set - the ones with the red handle are adequate for most dogs. If they are touchy about having their nails done, you will need to go slowly in working with them to stay calm during nail trimming. With a new dog, we start by spending time "playing" with their feet while they lay next to us or in our lap. We massage the feet and separate each digit like you would as you trim. If they are afraid of the site of the trimmers themselves, then you can get them used to the trimmers in the same way. Just hold them in your hand as you cuddle. Once ok with the site of them, 'pretend' to clip a nail by moving the trimmers right next to their nails. Eventually you will trim just the tip of the nails, etc. I know it sounds like a lot of work but I think it is easier on the dogs and ultimately far less work for you than fighting them each time to get trimmed. Best wishes! I got this suggestion from my vet and have used it on every dog I've had since. Use a Dremel tool. It will take a few tries for the dogs to get used to the sound and the vibrations, so start out on low, then as they get used to it go to high. It is so much easier, and so very much safer than clippers. And it leaves the nails smooth instead of splintery. Plus it's easier to judge when to quit before hitting the quick, even on dogs (like mine) who have black nails. My dogs are so used to it that they just lay down and go to sleep while I do their nails. I have a dog (Dana) with ONE white nail, the rest are black. I am terrifiedto trim her nails after I nipped her quick once, and of course it bled. I have read many books and articles on the web how it's so easy to stop the bleeding with corn starch or quick stop. What bothers me is that it's mentioned so matter-of-factly, like it's painless. So now I put off doing her nails. Which I know is just as bad (or even worse) then taking the chance and cutting them, because I know that over grown nails hurt their paws when they walk and they split. When I do cut them I take off just a smidge, not enough to make any difference. There has to be a sure fire way to cut black nails without having to worry about hurting her. A drimmel sounds like a good idea. but she is so afraid of loud noises and her nails are too long that the friction would cause too much heat before I would notice. I have had my fingers burnt when I used to get acrylic nails. They would use a drimmel to rough up the surface of the nail and It hurt. any alternative ideas? Please? In case you are wondering what breed she is, she's a Pug/English Bulldog. yeah, I know. She looks more like a boxer/Pit. I have to carry her papers with me when I walk her. 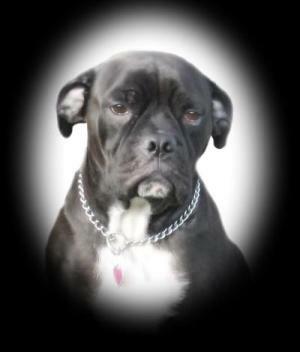 So many times I've come home only to have the by-law officer either approach me on our walk or come to my door shortly after, to question her breed. We have a big dog who practically had to be muzzled every time her nails were done at the vet or the groomer--she hated it so much. In line with everyone mentioning the Dremel tool--there is that As Seen on TV product you can find in nearly every drugstore, or Target, Kmart or Wal-Mart--called Pedi Paws. 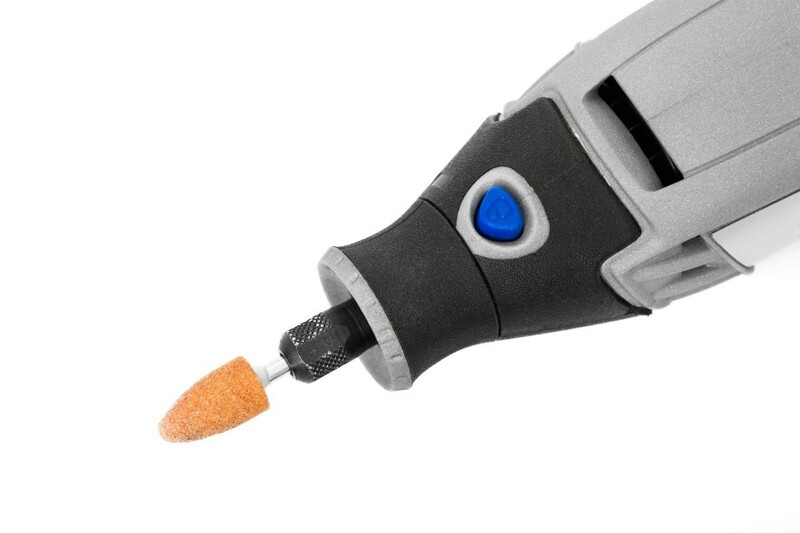 This is basically a dremel tool with a guard cap on it that helps you to line up the dog's nail ( and also catches the nail shavings). Yeah, it's noisy, but if you turn it on a few times and let the dog inspect it before even attempting to do the nails, most dogs will get used to the new "toy". We've had no drama since using this; think we paid no more than 12-14 dollars for it and it has been well worth the tiny investment. I wish I could trim my dogs nails myself too but even putting a mussle on him he still squirms so bad I can't handle him. He gets violent. The pet store doesn't seem to have a problem; they are calmer I guess but it still takes 2 people. My dog does not like his back feet touched or massaged. I got this suggestion from my vet and have used it on every dog I've had since. Use a Dremel tool. It will take a few tries for the dogs to get used to the sound and the vibrations, so start out on low, then as they get used to it go to high. It is so much easier, and so very much safer than clippers. And it leaves the nails smooth instead of splintery. Plus it's easier to judge when to quit before hitting the quick, even on dogs (like mine) who have black nails. My dogs are so used to it that they just lay down and go to sleep while I do their nails. Does anyone have any tips on how to successfully cut your dog's toenails? I can't get my dogs to sit still when trying to cut their nails and they don't like me touching their paws. I have a Pitbullmix and have the same problem. I solved it by cutting hers with a pair of toenail clippers. About every 2 weeks I just cut her tips of, and over time she got used to it Now I don't have any more problems. I wish you good luck. I recommend you use specialized clippers... 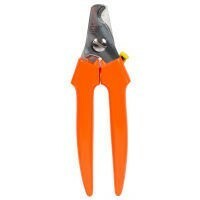 I use reptile or bird clippers, they have a roundish cutting surface or it hurts the animal less. As far as them letting you do it. You eaither need someone to help you force them til they get used to it or give them some kind of sedative to relax them.... You can administer things like valium, xanax & most other relaxants, in EXTREMELY small doses. (go by their weight for that) or if that is not possible, your vet could give you something. I have two large dogs. I do their toenails at night when they are tired and sleepy. My male is easier to do than my female. (I had to prove to her that I was alpha. I had to gently pin her down until she stopped fighting me and relaxed.) My vet told me a way that helps, but it takes two people. 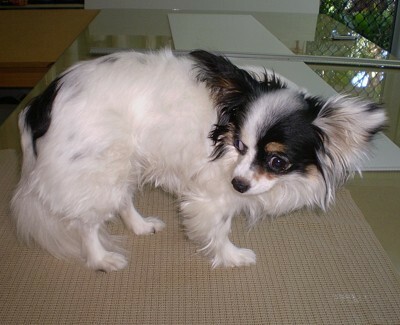 One person sits behind the dog's shoulders (while the dog is lying down) with their leg over the dog's head/neck area. That same person holds the dog's bottom leg (the front leg against the ground) just above the dog's elbow and lifts that leg up somewhat. This restrains the dog without hurting them. I had an Alaskan Malamute that at 6 months weighed over 80 pounds. 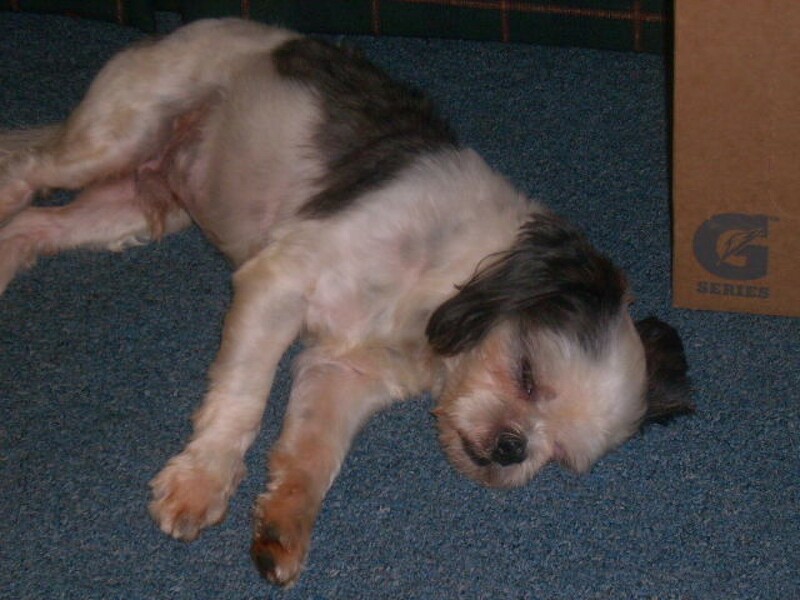 As a puppy, she was spent a lot of time in the basement with concrete floor and walls. She was very active and that kept her nails short. Of course, there were gouges in the concrete block stone wall near where she played with her toys. When she started spending more time in the main living area, I knew I had to start trimming her nails. In preparation, I spent a bit of time every day just handling her paws. The first few nail trimming sessions were a struggle. I actually got on top of her, holding her body down with mine - shoulder to shoulder, knees on each side of her hips. I reached around her neck to hold her paw in one hand using the clippers in the other. I spoke softly to her as I clipped each nail. By the time she was a year old and weighed 30 pounds more than me, I was able to trim her nails without a struggle and without holding her down. I did not use the popular guillotine style nail trimmer. I found one for large dogs that looked much like the garden trimmer used to trim small tree branches. 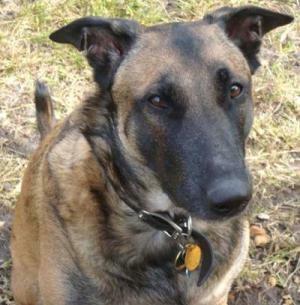 I still use that nail trimmer today on a 27 pound dog & it works great! Get a quality trimmer and take care of it. 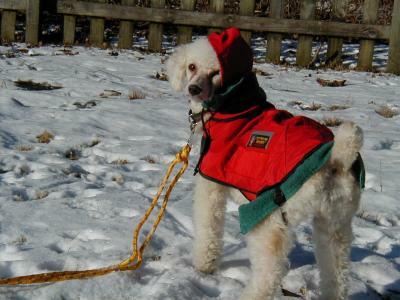 Spend some happy time getting your furry friend used to having their paws handled. Use a bright light to help finding how short to trim the nails. Good Luck! A Dremel sanding tool can be a good alternative to clippers for trimming your dogs nails. 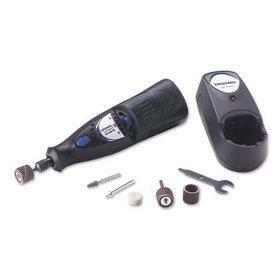 This is a guide about using Dremel tool for dog nail trimming. I have seen the nail clippers for dogs at the Dollar Store and I have been wanting to clip my own dogs nails to save some money on grooming. Is it difficult? I know you are not supposed to clip too far back as you can cut the blood vessel (that scares me!) but are there any tips someone can give me to do this? I have two Poms and a Yorkie. TIA! All tips above true; powder is styptic powder. Many men have it in the house for shaving incidents. 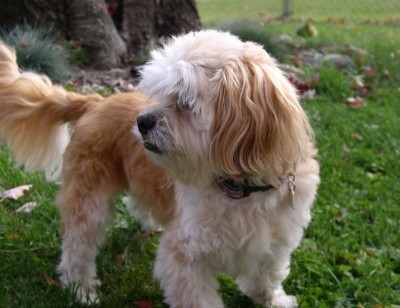 It's cheaper to buy from a drugstore than as a dedicated dog product. Most imp. 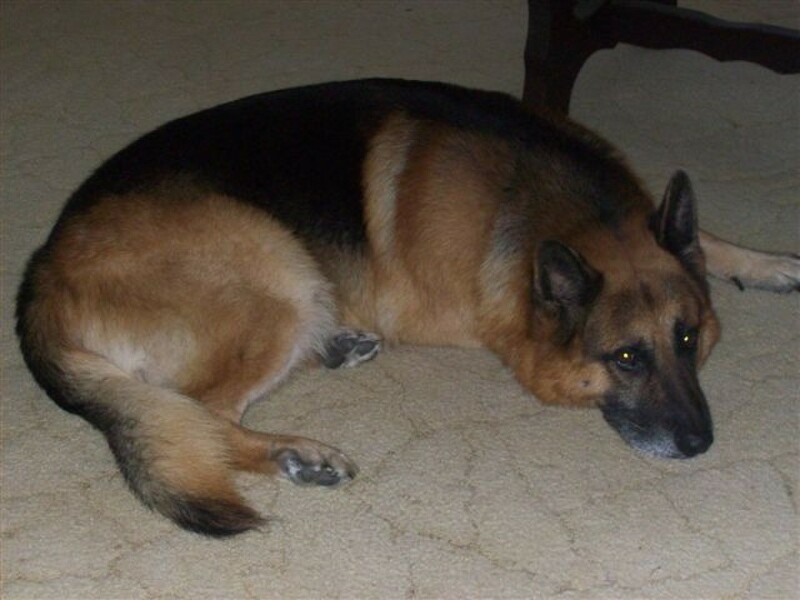 aspect is your dog's attitude and your own. If you approach it confidently and dogs are used to having feet handled, that is optimal. You can get them used to having feet handled little by little as above. You can also snip a nail or two every day if you have one that really hates the process. But you really have to project confidence about it, or the dog is going to run like you would if you had a doctor coming at you with a needle in quavering hands, saying "I've never done this, and I sure hope I don't hurt you." Many ppl use a Dremel or Dremel-type. There are cordless ones available for dog's claws for ~$10. Those are much quieter and help many dogs who freak at the noise. Start small. You can always clip more, not less. Clipping the quick or bloodline causes a lot of bleeding, hurts the dog and traumatizes the owner for life (I think the dog gets over it more quickly.) So just snip a little on each. You'll have to do it more often, but you'll feel confident, and your dog will too! I like to groom a little every day as part of petting. I've groomed my dogs for shows & know that every dog can get used to staying on a grooming table, but it's a lengthy Big Deal. I like to make it just a little part of life.